So what is kettle corn? So glad you asked! Not everyone is familiar with the amazing experience of this perfect snack. Kettle corn is sweet, salty popcorn made by adding sugar during popping and adding just the right amount of salt afterward. The result is a snack that features a perfect balance between sweet and savory. In the beginning, popping engineers (okay, that’s not a real thing, but it should be) made kettle corn in cast iron kettles. How kettle corn is made has since evolved, but the basic idea remains the same. 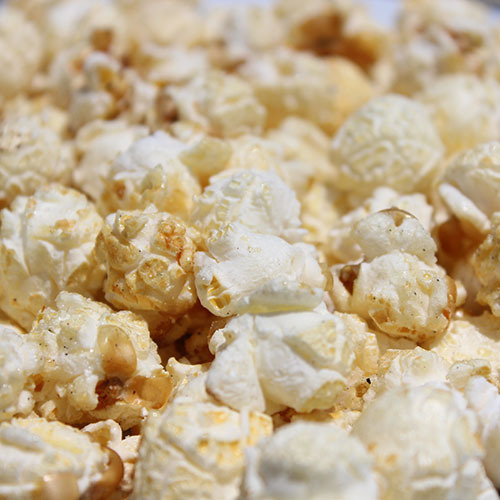 Kettle corn first appeared in the United States around 1776. People enjoyed this treat at fairs, festivals and other public celebrations. According to historical records, kettle corn was usually cooked in a cast iron kettle or Dutch oven, creating a sweet crust on the outside of the corn. While it faded from popularity somewhat in the 20th century, kettle corn has come back in a big way for the 21st century. Modern kettle corn is most often prepared in stainless steel or copper kettles, but some enthusiasts still use cast iron cauldrons. Whatever the preparation method, kettle corn is still best when it’s fresh, crafted with love, and hand-made from quality ingredients. Not coincidentally, that’s just how we do it. What Makes Our Kettle Corn the Best? So what makes our kettle corn the best _______ kettle corn in the world? We start with great, simple ingredients: mushroom corn kernels, canola oil, sugar and salt. Our ingredients are non-GMO and contain no animal products or preservatives. Our rustic, hand-made approach to our kettle corn. Our product is popped “to order.” That means it doesn’t sit around getting stale before we ship it. It’s popped fresh and sent out fresh. We use a high-volume, propane-powered Mann kettle, the finest kettle ever made. The patented, stainless steel Mann was the first kettle on the market, and it’s still the best. Our kettle is named Pappy. Kettle corn is better when the kettle has a name. That’s just science. First, we heat the oil until the the faintest ripple appears on the surface. Then we submerge our mushroom corn kernels in the oil. We stir the corn constantly with a wooden paddle to prevent burning. Once the “base” is created (the point where the oil is no longer visible) we add the sugar. We continue stirring the product until all kernels have popped. The kettle corn get dumped into the receiver to cool, and to prepare it for an application of quality fine-ground salt. Salt distribution is no game! We make sure to add just the right amount of salt for optimum flavor. Then the most delicious _______ kettle corn known to humankind is ready to enjoy! Don’t believe our kettle corn is the best in the world? We’ll take that challenge! Try a bag and find out for yourself!